When it comes to fat loss the common misconception is that it’s all about struggling through a calorie deficit and hitting hours upon hours of cardio. This is one of the many fat loss myths that will be busted and discussed in our free seminar on the 27th of February. The finer details of nutrition are often overlooked in relation to improving body composition and overall health. The latest trends either rule out whole food groups, or take an 'If it fits your macros' approach, which completely disregards the importance of food quality and consequentially health. Both of these approaches have a hugely detrimental impact on our metabolic flexibility (your ability to use each of the macronutrients for fuel) and have no regard for the nuisances that make nutrition a bio-individual subject. A cookie-cutter programme is not going to be your sustainable answer to fat loss. The key to finding a sustainable fat loss and weight management program starts with education. Understanding the effects of stress hormones, fluctuating blood sugar levels, poor digestion, nutrient deficiencies, adrenal fatigue and oestrogen dominance among other factors is really important. Get guidance on how to balance all of these areas through appropriate training, optimal meal plans and advice on snacking. Learn how sleep and stress effect your food intake and digestion, and get tips on how to tweak your nutrition and lifestyle to promote health and fat loss with sustainable habits and long-term effects. When it comes to weight loss, emphasis should be on giving you the tools and knowledge to develop healthy habits, which meet your individual needs. Everybody is different and what works for one person may not be optimal for another. 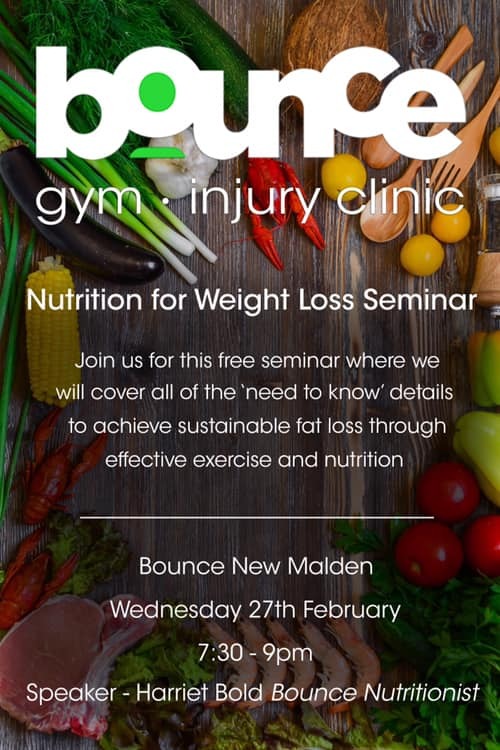 Join us on the 27th February and learn the truth about effective weight loss programs.